For other uses, see Lyre (disambiguation). The lyre (Greek: λύρα, lýra) is a string instrument known for its use in Greek classical antiquity and later periods. The lyre is similar in appearance to a small harp but with distinct differences. In organology, lyres are defined as "yoke lutes", being lutes in which the strings are attached to a yoke that lies in the same plane as the sound-table and consists of two arms and a cross-bar. 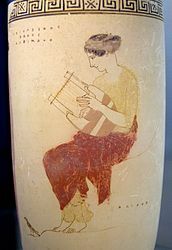 In Ancient Greece, recitations of lyric poetry were accompanied by lyre playing. The earliest picture of a lyre with seven strings appears in the famous sarcophagus of Hagia Triada (a Minoan settlement in Crete). 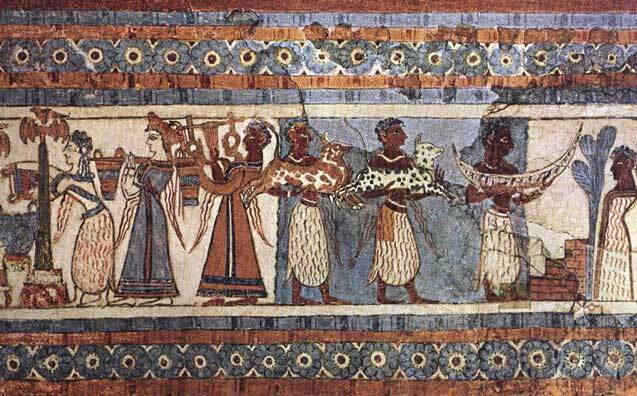 The sarcophagus was used during the Mycenaean occupation of Crete (c. 1400 BC). The lyre of classical antiquity was ordinarily played by being strummed with a plectrum (pick), like a guitar or a zither, rather than being plucked with the fingers as with a harp. The fingers of the free hand silenced the unwanted strings in the chord. Later instruments, also called "lyres", were played with a bow in Europe and parts of the Middle East, namely the Arabic rebab and its descendants, including the Byzantine lyra. The earliest reference to the word is the Mycenaean Greek ru-ra-ta-e, meaning "lyrists" and written in the Linear B script. In classical Greek, the word "lyre" could either refer specifically to an amateur instrument, which is a smaller version of the professional cithara and eastern-Aegean barbiton, or "lyre" can refer generally to all three instruments as a family. The English word comes via Latin from the Greek. The term is also used metaphorically to refer to the work or skill of a poet, as in Shelley's "Make me thy lyre, even as the forest is" or Byron's "I wish to tune my quivering lyre, / To deeds of fame, and notes of fire". A classical lyre has a hollow body or sound-chest (also known as soundbox or resonator), which, in ancient Greek tradition, was made out of turtle shell. Extending from this sound-chest are two raised arms, which are sometimes hollow, and are curved both outward and forward. They are connected near the top by a crossbar or yoke. An additional crossbar, fixed to the sound-chest, makes the bridge, which transmits the vibrations of the strings. The deepest note was that farthest from the player's body; since the strings did not differ much in length, more weight may have been gained for the deeper notes by thicker strings, as in the violin and similar modern instruments, or they were tuned by having a slacker tension. The strings were of gut. They were stretched between the yoke and bridge, or to a tailpiece below the bridge. There were two ways of tuning: one was to fasten the strings to pegs that might be turned, while the other was to change the placement of the string on the crossbar; it is likely that both expedients were used simultaneously. Pothos (Desire), restored as Apollo Citharoedus during the Roman era (1st or 2nd century AD, based on a Greek work c. 300 BC); the cithara strings are not extant. According to ancient Greek mythology, the young god Hermes stole a herd of sacred cows from Apollo. In order not to be followed, he made shoes for the cows which forced them to walk backwards. Apollo, following the trails, could not follow where the cows were going. Along the way, Hermes slaughtered one of the cows and offered all but the entrails to the gods. From the entrails and a tortoise/turtle shell, he created the Lyre. Apollo, figuring out it was Hermes who had his cows, confronted the young god. Apollo was furious, but after hearing the sound of the lyre, his anger faded. Apollo offered to trade the herd of cattle for the lyre. Hence, the creation of the lyre is attributed to Hermes. Other sources credit it to Apollo himself. Locales in southern Europe, western Asia, or north Africa have been proposed as the historic birthplace of the genus. The instrument is still played in north-eastern parts of Africa. Some of the cultures using and developing the lyre were the Aeolian and Ionian Greek colonies on the coasts of Asia (ancient Asia Minor, modern day Turkey) bordering the Lydian empire. Some mythic masters like Musaeus, and Thamyris were believed to have been born in Thrace, another place of extensive Greek colonization. The name kissar (cithara) given by the ancient Greeks to Egyptian box instruments reveals the apparent similarities recognized by Greeks themselves. The cultural peak of ancient Egypt, and thus the possible age of the earliest instruments of this type, predates the 5th century classic Greece. This indicates the possibility that the lyre might have existed in one of Greece's neighboring countries, either Thrace, Lydia, or Egypt, and was introduced into Greece at pre-classic times. The number of strings on the classical lyre varied at different epochs and possibly in different localities—four, seven, and ten having been favorite numbers. They were used without a fingerboard, no Greek description or representation having ever been met with that can be construed as referring to one. Nor was a bow possible, the flat sound-board being an insuperable impediment. The pick, or plectrum, however, was in constant use. It was held in the right hand to set the upper strings in vibration; when not in use, it hung from the instrument by a ribbon. The fingers of the left hand touched the lower strings (presumably to silence those whose notes were not wanted). There is no evidence as to the stringing of the Greek lyre in the heroic age. 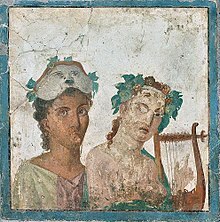 Plutarch says that Olympus and Terpander used but three strings to accompany their recitation. As the four strings led to seven and eight by doubling the tetrachord, or series of four tones filling in the interval of a perfect fourth, so the trichord is connected with the hexachord or six-stringed lyre depicted on many archaic Greek vases. The accuracy of this representation cannot be insisted upon, the vase painters being little mindful of the complete expression of details; yet one may suppose their tendency would be rather to imitate than to invent a number. It was their constant practice to represent the strings as being damped by the fingers of the left hand of the player, after having been struck by the plectrum held in the right hand. Before Greek civilization had assumed its historic form, there was likely to have been great freedom and independence of different localities in the matter of lyre stringing, which is corroborated by the antique use of the chromatic (half-tone) and enharmonic (quarter-tone) tunings pointing to an early exuberance, and perhaps also to a bias towards refinements of intonation. Gärtner Lyre.This modern lyre was created by Edmund Pracht and W. Lothar Gärtner in 1926. Lyre from various times and places are sometimes regarded by organologists as a branch of the zither family, a general category that includes not only zithers, but many different stringed instruments, such as lutes, guitars, kantele, and psalteries. Others view the lyre and zither as being two separate classes. Those specialists maintain that the zither is distinguished by strings spread across all or most of its soundboard, or the top surface of its sound-chest, also called soundbox or resonator, as opposed to the lyre, whose strings emanate from a more or less common point off the soundboard, such as a tailpiece. Examples of that difference include a piano (a keyed zither) and a violin (referred to by some as a species of fingerboard lyre). Some specialists even argue that instruments such as the violin and guitar belong to a class apart from the lyre because they have no yokes or uprights surmounting their resonators as "true" lyres have. This group they usually refer to as the lute class, after the instrument of that name, and include within it the guitar, the violin, the banjo, and similar stringed instruments with fingerboards. Those who differ with that opinion counter by calling the lute, violin, guitar, banjo, and other such instruments "independent fingerboard lyres," as opposed to simply "fingerboard lyres" such as the Welsh crwth, which have both fingerboards and frameworks above their resonators. The so-called lyres of Ur, excavated in ancient Mesopotamia (modern Iraq), date to 2500 BC and are considered to be the world's oldest surviving stringed instruments. Over time, the name in the wider Hellenic space came to be used to label mostly bowed lutes such as the Byzantine lyra, the Pontic lyra, the Constantinopolitan lyra, the Cretan lyra, the lira da braccio, the Calabrian lira, the lijerica, the lyra viol, the lirone. Other instruments known as lyres have been fashioned and used in Europe outside the Greco-Roman world since at least the Iron Age. The remains of what is thought to be the bridge of a 2300-year-old lyre was discovered on the Isle of Skye, Scotland in 2010 making it Europe's oldest surviving piece of a stringed musical instrument. Material evidence suggests lyres became more widespread during the early Middle Ages, and one view holds that many modern stringed instruments are late-emerging examples of the lyre class. There is no clear evidence that non-Greco-Roman lyres were played exclusively with plectra, and numerous instruments regarded by some as modern lyres are played with bows. Lyres appearing to have emerged independently of Greco-Roman prototypes were used by the Germanic and Celtic peoples over a thousand years ago. Dates of origin, which probably vary from region to region, cannot be determined, but the oldest known fragments of such instruments are thought to date from around the sixth century of the Common Era. After the bow made its way into Europe from the Middle-East, around two centuries later, it was applied to several species of those lyres that were small enough to make bowing practical. There came to be two broad classes of bowed European yoke lyres: those with fingerboards dividing the open space within the yoke longitudinally, and those without fingerboards. The last surviving examples of instruments within the latter class were the Scandinavian talharpa and the Finnish jouhikko. Different tones could be obtained from a single bowed string by pressing the fingernails of the player's left hand against various points along the string to fret the string. The last of the bowed yoke lyres with fingerboard was the "modern" (c. 1485–1800) Welsh crwth. It had several predecessors both in the British Isles and in Continental Europe. Pitch was changed on individual strings by pressing the string firmly against the fingerboard with the fingertips. Like a violin, this method shortened the vibrating length of the string to produce higher tones, while releasing the finger gave the string a greater vibrating length, thereby producing a tone lower in pitch. This is the principle on which the modern violin and guitar work. While the dates of origin and other evolutionary details of the European bowed yoke lyres continue to be disputed among organologists, there is general agreement that none of them were the ancestors of modern orchestral bowed stringed instruments, as once was thought. Asor – an otherwise unknown instrument mentioned in the Old Testament which may have been a type of lyre. Barbiton (Barbitos) – a bass version of the Cithara (Kithara). Cithara (Kithara) – the version of the lyre used by professional musicians. ^ Image of Hagia Triada Sarcophagus, University of Arkansas. ^ J. A. Sakellarakis. Herakleion Museum. Illustrated Guide to the Museum. Ekdotike Athinon, Athens 1987, p. 113 f.
^ "rabab (musical instrument) - Encyclopædia Britannica". Britannica.com. Retrieved 2013-08-17. ^ Palaeolexicon, word study tool of ancient languages. ^ a b c d West, Martin L. (1992). Ancient Greek Music. Oxford, UK: Oxford University Press. ISBN 0-19-814975-1. ^ a b Article "λύρα", in Henry George Liddell, Robert Scott, A Greek-English Lexicon, on Perseus Digital Library. ^ Lord Byron (1807), Hours of Idleness: To His Lyre. ^ Entry "Lyre" at Dictionary.com. Retrieved on 2012-09-17. ^ For example, the Annales Cambriae (B Text). ^ a b "BBC News - Skye cave find western Europe's 'earliest string instrument'". BBC.co.uk (2012-03-28). Retrieved on 2012-09-17. ^ "'Europe's oldest stringed instrument' discovered on Scots island". STV (2012-03-28). Retrieved on 2012-09-17. Chisholm, Hugh, ed. (1911). "Lyre" . Encyclopædia Britannica (11th ed.). Cambridge University Press. Wikimedia Commons has media related to Lyres.